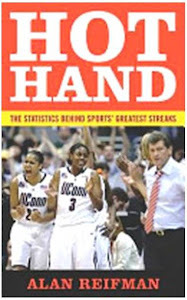 The Hot Hand in Sports: How Much of an Advantage is Hosting Middle Three Games in NBA Finals 2-3-2 Format? How Much of an Advantage is Hosting Middle Three Games in NBA Finals 2-3-2 Format? Since 1985, the NBA has used a 2-3-2 format for the final series. In other words, for a theoretical seven-game series, the team with the better regular-season record hosts the first two games, then the next three games are played in the other team's arena, with the final two games returning to the home of the team with the better regular-season record. A question that sometimes comes up is whether having three games in a row at home (as opposed to a 2-2-1-1-1 format) gives the team with the poorer regular-season ledger a special momentum-based advantage. This question is again relevant, in light of how this year's final series has gone. The Miami Heat, after splitting the first two games of this year's finals in Oklahoma City, has, of course, won Games 3 and 4 at home and will be going for the championship tonight while again playing in Miami. Based on this list of NBA championship match-ups (with further details available by clicking on the year in the chart in the linked document), I counted eight years (prior to the current season) in which a team had won Games 3 and 4, giving it the opportunity to "ride the wave" to win also in Game 5. In three of these eight final series, it was actually the road team that caught fire in Games 3-5. The 1990 Detroit Pistons, 1991 Chicago Bulls, and 2001 L.A. Lakers all split the first two games of their respective series at home, then won three straight on the road to win titles. More relevant for tonight's Thunder-Heat tilt are the five cases from 1985-2011 in which the home team won Games 3 and 4 at home. They are listed in the following table. Given the small sample size, these findings should be interpreted very cautiously. For what it's worth, however, three of the five teams that won Games 3 and 4 at home went on to lose in Game 5. The two series that best resemble this year's in terms of the win-loss patterns for the home and away teams are those from 1998 and 2004 (highlighted above in red). These two series offer a mixed verdict for 3-4-5 momentum. In 1998, Michael Jordan's Chicago Bulls split the first two games of the finals in Utah, then returned to the Windy City to win Games 3 and 4. With a chance to close out the series at home in Game 5 (akin to the Heat tonight), the Bulls faltered. They ultimately did win the series, though, back in Utah with a Game-6 victory over the Jazz. In 2004, the Detroit Pistons split the first two games against the Lakers in L.A., then won Games 3 and 4 in Michigan to take a 3-1 lead. There was no stopping the host Pistons in Game 5, as they dispatched the Lakers 100-87 to win the championship. Again, there are not many data points on the specific situation facing Miami and OKC tonight. However, the little historical evidence we have suggests that the Heat is not an absolute shoo-in for coronation in Game 5.